No air conditioner? Don't despair! This easy-to-make DIY sunshade will help cool off your next backyard barbecue and beyond. Use it to keep comfortable all season long—without running up your electric bill. Some days, hanging out under an awning is the closest we can get to enjoying the breeze underneath a shady beach umbrella. The relief is real: That soft wind you feel in the shade can be up to 20 degrees cooler than the temperature out in direct sunlight! Well, you’ll be happy to know that squeezing some shade into your own backyard just got easier. Whether your outdoor space consists of a patch of grass around the side of the apartment or a full-fledged suburban backyard, you can craft a tented oasis, using just a single set of instructions. 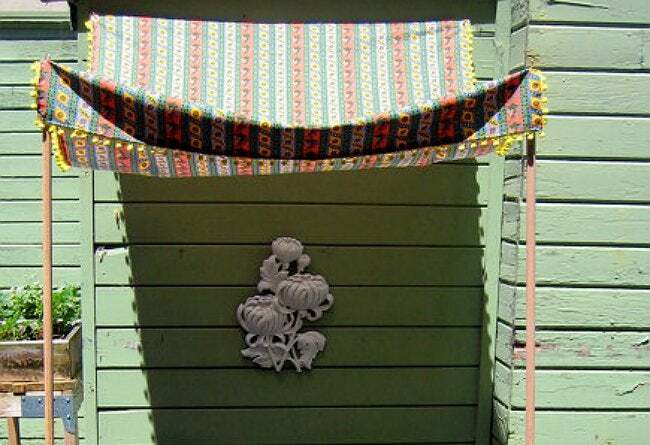 This DIY sunshade on Design*Sponge can be tailored to cool off nearly any space. The premise is simple and easily convertible. 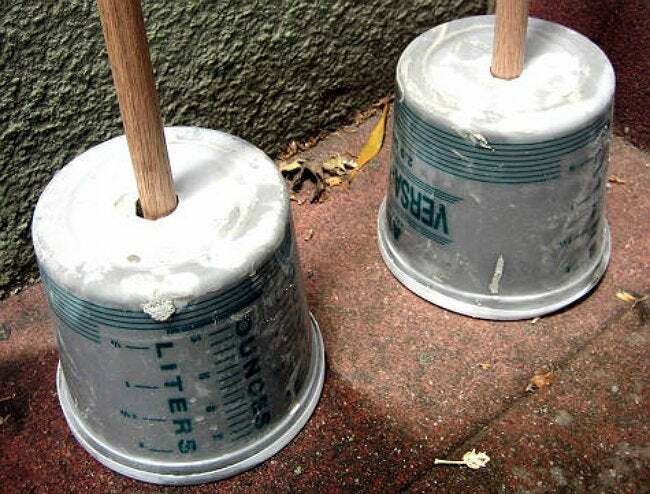 Create two sturdy supports for the base of the structure by sticking dowels into two plastic buckets filled with quick-setting concrete. As the concrete hardens, you can decide how far apart you’d like to position the supports; this will determine the width of your awning and, ultimately, how much fabric you’ll need for your shade. Four tiny cup hooks—two screwed into the top of the dowels and two along a nearby exterior wall—will serve to catch grommets that you’ll add to the four corners of your shade to hold it in place. Then, whenever you’re ready to cool off outside, simply set up your two poles a few feet in front of the wall and hook the shade into position. Warning: If you dress it up just right with an eye-catching fabric, you may make your neighbors insanely jealous. For best results, mix up a margarita and camp out in your favorite folding chair for the afternoon.